The roots of evil run deeper than you can ever imagine. Lucas Sawyer and his wife Tamsen find themselves marooned in the heart of a mid-nineteenth century wilderness forest. They are rescued by Jonah Duvall, a mysterious woodsman abiding in this strange valley with his wife Jezebel and thier son Cord. Brooding over all stands the Devil Tree - a huge evil jackpine that has summoned them to this valley to feed upon their collective emotions and their unnatural offspring. Part earth spirit, part elder demon - the tree is farming them. The characters are bound in a tightening noose of of undeniable fate. As winter sets in they must face the tree's unholy fury in an utterly horrific finale. 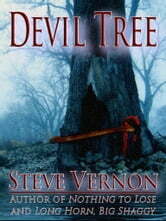 Devil-Tree is a story that will take you further into the heart of unimaginable horror.